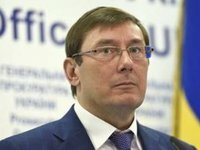 Ukraine's Prosecutor General Yuriy Lutsenko has publicly called on Prime Minister Volodymyr Groysman to change the team at the customs, which are now part of the State Fiscal Service, to restore the State Customs Service as a legal entity and appoint its chief by means of a competition. "I've called on him informally to reshuffle the customs team. Now I am doing it publicly. I think that there cannot be any order at the customs in this country where there has been no customs service chief for three years. I think if we appoint another acting chief, nothing will be solved. Because that day when he was appointed millions of contraband items were found at his customs," Lutsenko said in an interview with the Kyiv-based Ukrainska Pravda online newspaper. According to Lutsenko, customs remains one of the three main sources of corruption, along with licensing of mineral deposits and management of state-owned enterprises. "In my opinion, the government should restore the State Customs Service as a legal entity and call a tender, appoint a person who enjoys public trust. The next step is to do what was done with the National Police of Ukraine – hire a new customs team," he said. Lutsenko said new customs service leaders should be selected by competition and judged by the public. "The fourth step," Lutsenko said, "is restoring analytical centers, which have simply disappeared. The fifth step is to deal seriously with well-known smuggling clans." The prosecutor general said he has complaints about acting State Fiscal Service head Myroslav Prodan. "Yes, I have complaints about Prodan. For now, I am complaining about many smuggling cases his subordinates allowed to happen. But now I am working on a case in which I have complaints against him personally. After I gather enough evidence, I will make a decision on procedure," Lutsenko said in the interview. As earlier reported, at the start of July, Ukraine's Cabinet appointed acting State Fiscal Service (SFS) head Viktor Kryvitsky, who earlier headed the State Fiscal Service's branch in Volyn region. Lutsenko said earlier that there were major violations made by Prodan as acting SFS chief, adding that an investigation had been underway since February 2018. The SFS in response said it was ready to answer any questions law-enforcement agencies might have.